What do you get when six friends make a pact not to let love get in the way of their careers? The No Brides Club—and the question: Could meeting the right man at the wrong time cause them to break their vows to each other? 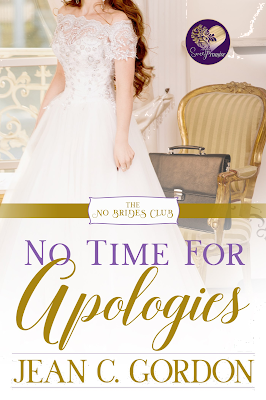 My No Brides Club book, No Time for Apologies, releases tomorrow, February 1. These fun romances centered around six career women in New York City can be read individually or as a series--in any order. Kate Lewis left her family's dairy farm and fell in love with everything about New York City's especially the high-powered, fast-paced world of finance. Once content to lie in the grass and watch clouds float across the sky, her biggest dream now is to work her way to the top of Wall Street. Jon Smith is so much more than his plain name implies. He's also a rising star in the world of finance, on a mission to save his grandfather's cattle farm, and Kate's former high school admirer. When a shocking twist of fate puts these two in direct competition for a job they both covet, the last thing they need is any new sparks of attraction. Too bad fate isn't done with them yet. Great story and gorgeous cover, Jean. Congrats on your new release! Thanks. I'm excited about it. Congratulations, Jean! This looks like such a fun series!